Fair Food Program gets its very own website! From 2001 to 2010, CIW members traveled the country with the Campaign for Fair Food, educating consumers about the human rights crisis that had plagued Florida’s fields for generations. Like farmworkers everywhere across the United States, workers in Immokalee faced abuses that ranged from systemic wage theft to rampant sexual harassment and even modern-day slavery. But through the Campaign for Fair Food, the CIW was able to build a national alliance of conscious, mobilized consumers and, over the course of the last decade, successfully pressure the major corporate buyers of Florida tomatoes to address the abuses in their supply chains. And today, thanks to that union of workers and consumers, farmworkers in Florida’s tomato industry no longer suffer the abuses of the past. Slavery and sexual violence have been eliminated, wage theft and other labor rights violations are now the rare exception rather than the rule, and when abuses do occur, workers have access to a fast and effective complaint investigation and resolution system to defend their rights. How has this remarkable transformation been possible? Starting in 2011, the Fair Food Program — the unique partnership among workers, growers, and retail purchasers that monitors and enforces the worker-designed Fair Food Code of Conduct — began the hard, day-to-day work of identifying and eliminating bad actors and bad practices in the Florida tomato industry. Now entering its fourth season, the Fair Food Program has slowly but surely reformed the industry into the more modern, more humane workplace that workers envisioned when they launched the campaign a decade earlier. And today, the Fair Food Program has been called “the best workplace-monitoring program” in the US in the New York Times, and “one of the great human rights success stories of our day” in the Washington Post. 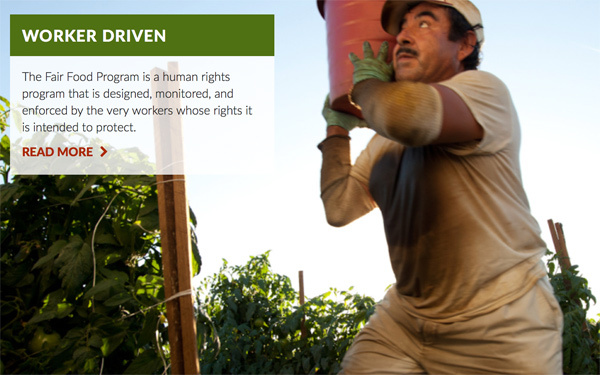 The new Fair Food Program site describes the unique mix of mechanisms that make up the Program’s sophisticated, worker-driven social responsibility approach and explains their interaction. It also provides qualitative and quantitative measures of the Program’s results and informs readers of how they can join the growing Fair Food movement to help expand the Program’s unprecedented gains. So head on over to the new website and take a look around! And when you have, tell your friends and family to check it out too, so they can learn about — and become part of — the movement that is the future of human rights in this country’s food system. And, of course, keep coming back here — to the good old CIW site — for all the latest news and analysis from the Campaign for Fair Food! Bill Maher, Eva Longoria talk “Food Chains,” Fair Food Program on HBO’s Real Time!